When I travel, I like to have a broad outline of where I am going, some idea of the things I want to see and importantly, a familiarity with local culture and traditions. I also like to leave large parts of the planning up to one of my favorite traveling companions; serendipity. It is always a matter of balance, but now that I am retired I can take a bit more time and allow experiences to present themselves and flow over me instead of blindly forging ahead and trying to tic as many pre-planned experiences off of an adventure list written by others. 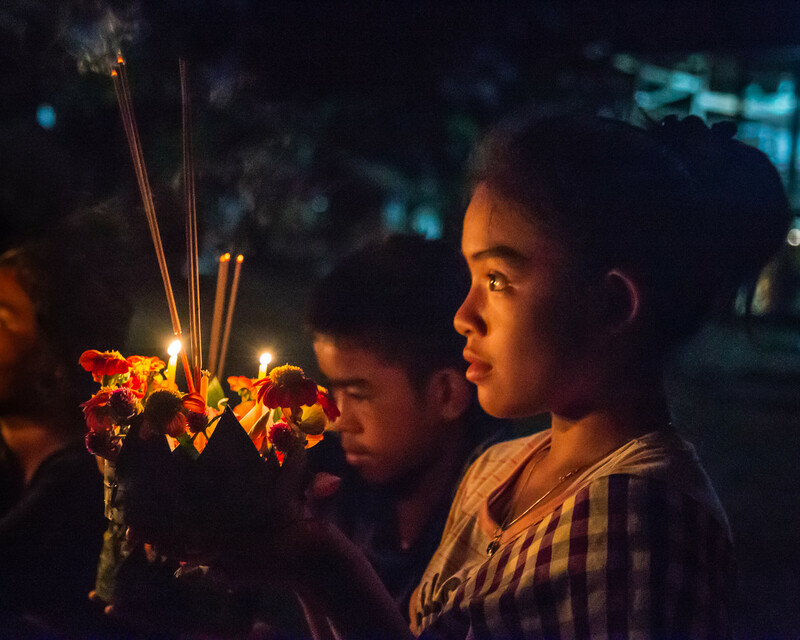 Inevitably, if we had had every second of our itinerary inflexibly carved into stone we would miss moments like Buddhist Lent Day or Boun Ok Phansa at Tat Lo, Laos. Well, at least we think we were witnessing a Boun Ok Phansa, or Buddhist Lent Day, a Buddhist celebration that marks the end of Buddhist Lent. 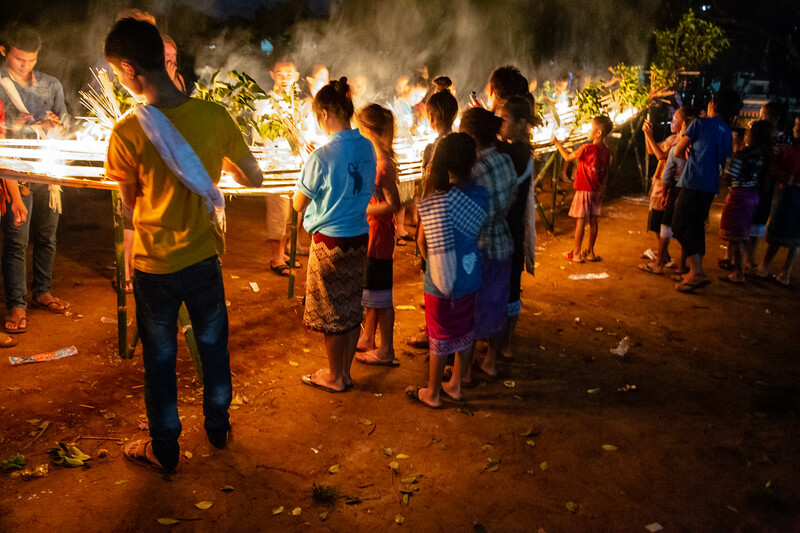 In Lao culture, there are so many overlapping events, celebrations and other “boun”, (the Laotian word for festivals) that, when moving from village to village, you can lose track of who is celebrating what where. Add to that an extreme amount of laid back flexibility about dates and when things should happen, when traveling in Laos, or anywhere in Southeast Asia for that matter, you just kind of have to have some faith that flexibility and serendipity will offer up some pretty amazing things to see and experience. 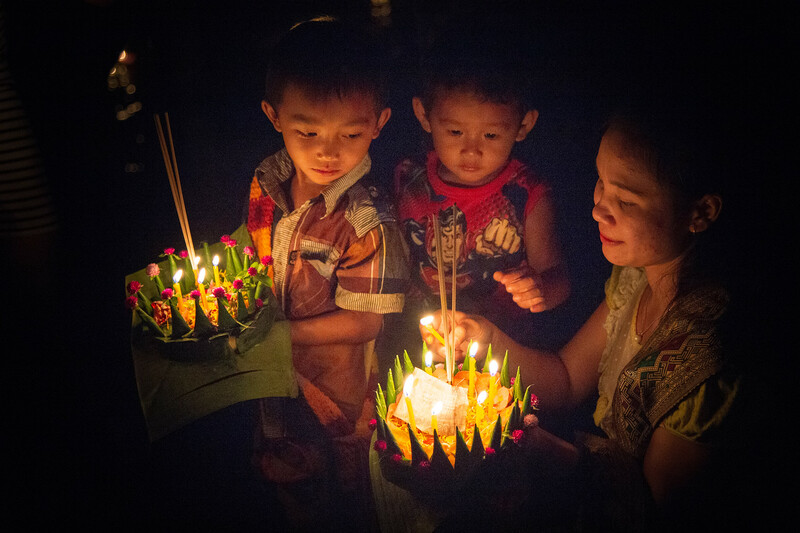 There was an intense feeling of excitement about Buddhist Lent Day from the moment we arrived in Tat Lo. 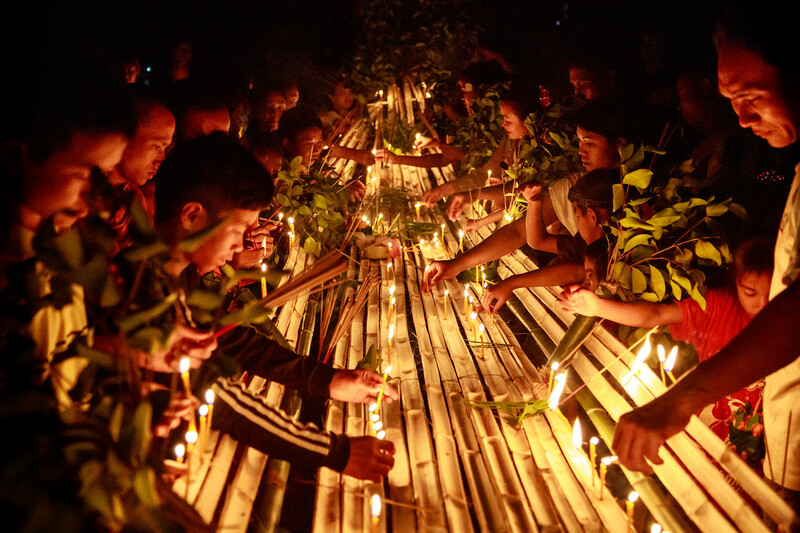 The temple was filled with young laymen building a boat out of strips of bamboo and it seemed that at every home residents were building “krathong”, (floating baskets made of banana leaves designed to be filled with offerings) so that they may later place them in the nearby river and symbolically wash their worries and bad karma away. That evening it seemed that everyone in the village was going to the temple so we followed along. As we were walking the teenage son of the owner of our guesthouse caught up with us and explained a bit about what was happening. At the temple, he even guided us through some of the rituals. I still can’t say I understood much of what was going with Buddhist Lent Day, but Boun Ok Phansa was a beautiful thing to observe. Because we were respectful and reverent of their traditions, we were allowed to not only witness what was usually a very local event; we were welcomed and in a small way allowed to participate. The owner’s son gave us candles to place on the boat and even took us to the river so that we could wash away some of our own cares. It was a beautiful experience that could never be duplicated. However, I know there are many more adventures such as this out there and I plan to continue to make myself available to them.